Competition for top talent in healthcare is remarkably intense, and it’s set to grow stronger in the years ahead. As healthcare practitioners, support occupations, and technical professions are some of the fastest-growing sectors in healthcare, hospitals and health systems are simultaneously facing severe talent shortages. 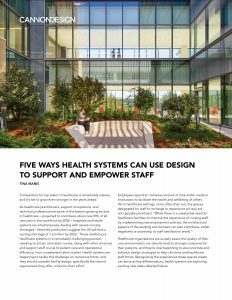 This piece looks at how designing healthcare spaces to promote staff satisfaction, wellness and engagement can differentiate health systems in the battle for talent and empower their people. It shares real-world examples from Centre hospitalier de l’Université de Montréal and Jacobs Medical Center while also considering future trends and drivers.